Mike Schmitz takes a look at the strengths and weaknesses of Dion Waiters with the help of Syracuse game film and commentary from head coach Jim Boeheim. Following an underwhelming freshman season in which he struggled to produce and failed to find a consistent role on a very talented team, Dion Waiters has developed into a key part of Syracuse's #2 squad as the team's sixth man this season. While Waiters' play has tailed off against more difficult competition, especially during conference play, he's had a solid season on the whole, giving Orange fans a much better idea why he was the 23rd ranked player in his high school class. On the offensive end, Waiters has made a real impact this season by being more opportunistic pushing the ball and getting out on the break, as he sees over 28% of his possessions in transition according to Synergy, which is especially impressive given Syracuse's just 178th ranked tempo according to Kenpom.com. A physically gifted player with an excellent frame and terrific instincts, Waiters' aggressive defense definitely fuels this area of his game by creating opportunities, but he does a very good job keeping his head up and attacking when his team has a numbers advantage. He's very crafty with the ball in his hands and does a good job of using his shiftiness going to the basket, switching the ball between hands and showing a very good feel for weaving through defenses. While not exceptionally quick or fast, Waiters has perhaps helped himself most here by showing a good commitment to using his well-built frame to go hard to the basket, frequently finishing with power and playing with a real mean streak on the break. In the half court setting, Waiters has performed best this year operating pick-and-rolls, showing a solid feel for balancing his own offense and finding open teammates. He does a good job making the simple pass to spot shooters, using separation from the pick to get a half step on his man, or pulling up for open jumpers in space. Unfortunately for Waiters, despite his pick-and-roll and transition prowess, he's struggled to consistently perform at a high level in most other areas of offense this season, most notably showing troubles consistently contributing in the half court against top competition. While Waiters possesses good ball-handling skills, excellent body control, and flashes of potent jump-shooting ability, he doesn't have a true go-to skill in the half court if unable to simply overpower his man, while also being plagued by errant decision-making at times. Waiters' jump shot is likely the area he can make the best short-term and long-term gains in improving his half court offense, as he shows a lot of potential in this area with his flashes of NBA range and ability to hit pull-up shots in space. He hurts himself here by often taking shots that are rushed, contested, unbalanced, or a combination of the three, while even his open spot-up jumpers are prone to bouts of inconsistency. Really buckling down in this area in either the pre-draft process or offseason should be his biggest priority going forward, and could do a great deal to ease his transition to the NBA game or take his game to the next level at Syracuse. As far as Waiters' shot-creating ability in isolation goes, he's had some issues staying consistent this season, but to his credit he doesn't force this area of his game much, having a pretty solid feel of his strengths and weaknesses. Most of his questionable decision-making in the half court stems from shot selection, as he keeps his turnovers pretty low at just 0.13 per possession. The other area Waiters could expand his game is as a floor general and shot creator for teammates, but this is something he hasn't shown much with in his two years on campus outside of his expanded pick-and-roll game. Waiters is a good passer and plays pretty well within his team's offense, but he doesn't show much penchant for breaking the defense down off the dribble and seems to lack a true floor general's mentality, so his most likely future is probably as combo guard who plays both on and off the ball depending on matchups. While Waiters has been somewhat of a mixed bag on the offensive end this season, the same cannot be said for his defensive performance, where he's been one of Syracuse's most effective and disruptive defenders this season, as chronicled in great depth by SI's Luke Winn. Waiters is extremely aggressive on this end of the floor, extending Syracuse's zone well beyond the college three-point line, being constantly in motion, and frequently picking off balls in the passing lanes to fuel his own transition game. He does a great job jumping out to contest shots and shows very good hustle and focus overall. 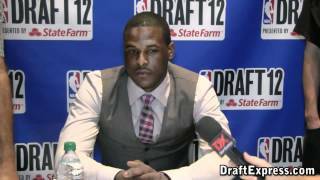 Waiters also does a good job using his strength to get over picks on pick-and-rolls, and works hard to stay in front of his man on the rare chance he sees a true isolation in Jim Boeheim's zone, but as always with Syracuse players, it's tough to get a perfect handle on this aspect of his game from a scouting perspective. With that said, considering his physical attributes and aggressiveness, it's not difficult to see him being capable of guarding both guard positions in the NBA, which should give his team plenty of versatility to work with. Looking forward, Waiters brings an interesting package of skills to the table along with a good amount of untapped potential. His style of play should seemingly translate well in a combo guard role off the bench as a sparkplug transition and pick and roll scorer who can defend multiple positions, which every NBA team seems to have at least one of these days. Waiters could help his stock by really putting in work with his jump shot, something he could demonstrate to teams a few months from now in workouts if he elects to declare for the draft. Despite finishing the season with a breakout performance in the Sweet Sixteen, rumors swirled that the freshman shooting guard would transfer. In addition to Syracuse's deep and talented 2011-2012 backcourt, Waiters and coach Jim Boeheim never seemed on quite the same page last season. Nevertheless, it seems as though Waiters will be returning to Syracuse for his sophomore season, rounding out one of the country's deadliest guard rotations. At 6'4 with a built 210-pound frame, Waiters is undersized for the shooting guard position without the length to compensate. While he has solid body control and quickness, he is far from an elite athlete, lacking the explosiveness to stand out in transition. Perhaps slimming down further would help him to maximize his athleticism, but he looks to be an average athlete, at best. Though Waiters had some bright spots on the offensive end of the floor, he struggled mightily with his shot selection as a freshman and finished the year averaging just 6.6 points per game while shooting just 47.6% from inside of the arc and 32.9% from three-point range. His shooting mechanics are inconsistent and his release can sometimes be a tad deliberate, but he is a solid shooter with NBA range. As mentioned earlier, the issue is more his shot selection and rhythm at this stage, because he can shoot the ball well on the move and with his feet set. Waiter is also a good shot creator, showing the ability to find pull-up jump shots from the mid-range and slash to the basket. His footwork off of the dribble is impressive, so even while he does not have the quickest first step or elite explosiveness, he still finds a way to get to the basket or create space to shoot. He is still not a great finisher, however, largely for the same reasons, something that he will have to work on going forward. Despite his shaky shot selection and his general reputation as a mistake-prone player, Waiters averages just 2.2 turnovers per-40 minutes pace adjusted against 3.6 assists. While he is by no means a point guard, he can operate a bit out of the pick and roll and made some solid passes out of traffic off of the dribble as a freshman. Despite Syracuse playing in a zone, Waiters will have to improve his defensive fundamentals significantly before seeing more minutes for Jim Boeheim. For one, his inability to get around picks and his generally average lateral quickness are significant issues that he must address. So, too, is his seeming lack of focus on that end floor. He may never be able to overcome his lack of height and length, but he must play harder and with more focus on the defensive end, especially as Syrcause's backcourt rotation deepens. How much Waiters matures and develops between his freshman and sophomore seasons will likely determine his playing time next season, as will his effort on the defensive end of the floor. It is not as if anybody underestimates his abilities on the offensive end of the floor; his 18 point performance on 8/10 shooting against Marquette in the Sweet Sixteen exemplified his scoring potential. Ultimately, it is up to Waiters to carve out a niche in Syracuse's crowded rotation, especially if he wants to live up to his high school hype while proving to scouts that he has what it takes to play at the next level.